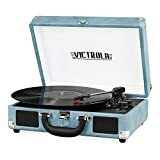 In my opinion, the modern designs of most current Bluetooth wireless speakers leave a lot to be desired, but when you combine vintage, turn of the 20th century classic design on the outside with state of the art modern components on the inside, you get this cool new yet very retro Victrola Gramophone Bluetooth Speaker. 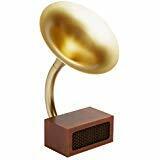 This powerful yet elegant Bluetooth speaker is housed inside an old fashioned Victrola gramophone housing with either a beautiful dark walnut or oak finish. 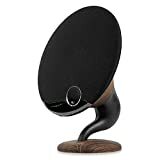 It features a symphonic 25 watt speaker combined with a booming built-in subwoofer, wireless Bluetooth connectivity, and a rechargeable battery that lasts up to 12 hours. If you always wished to play classical music on a gramophone that's resting on the corner of a picnic blanket in a flowery meadow, now you finally can. 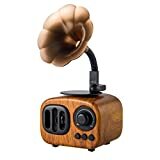 Also great for listening to music in the den while sipping brandy, especially if the music is streaming wirelessly from a Bluetooth turntable.